Simmering/stewing or braising is all the same - a fabulous way to bring out tenderness and remarkable flavours from some of the less tender cuts of beef. Prep is simple and cooking is hands-off. Make with Beef Short Ribs or Simmering Steak such as Blade, Cross Rib or Brisket, or Stewing Beef Cubes or Shank. Bulgogi-style Korean beef leftovers make a great lunch, OK even breakfast if you ask my daughter who regularly heats up dinner leftovers for breakfast. If you want to re-purpose leftovers into something new, check out the chop suey idea here. Heads up: braising brings out the terrific beef flavour but takes some time so this recipe works best on weekends. Kids Cook! Get your kids involved in the kitchen by having them help out with this recipe. Here’s what they can do! * Have them help measure ingredients, cut veggies using a kid-friendly knife, and stir cornstarch mixture. Dietitian's Tip: Even kids as young as 1- 3 years of age are getting too much sodium. Eating less processed and restaurant food is a first good place to start cutting back. Tweaking recipes helps too. By swapping ½ cup (125 mL) regular soy sauce with ¼ (60 mL) cup sodium-reduced soy sauce, I've cut 5350 mg sodium from this recipe below. Every tablespoon of sodium-reduced soy sauce has 600 mg of sodium. Season beef all over with salt and freshly ground pepper. Heat 2 tbsp (30 mL) oil over medium-high heat in Dutch oven or large heavy pot; add beef and brown all over. Combine garlic, soy sauce, brown sugar, gingerroot, onion, vinegar and water in 4 (1L) cup bowl. Pour over beef; bring to a boil. Cover and transfer to 325°F (160°C) oven; cook for 1-1/2 to 2 hours, until meat is fork-tender. To serve: remove beef to platter; keep warm. Stir in remaining cornstarch mixture into remaining cooking sauce; heat over high heat for 2 to 3 minutes, until bubbling and thickened slightly; spoon over beef. 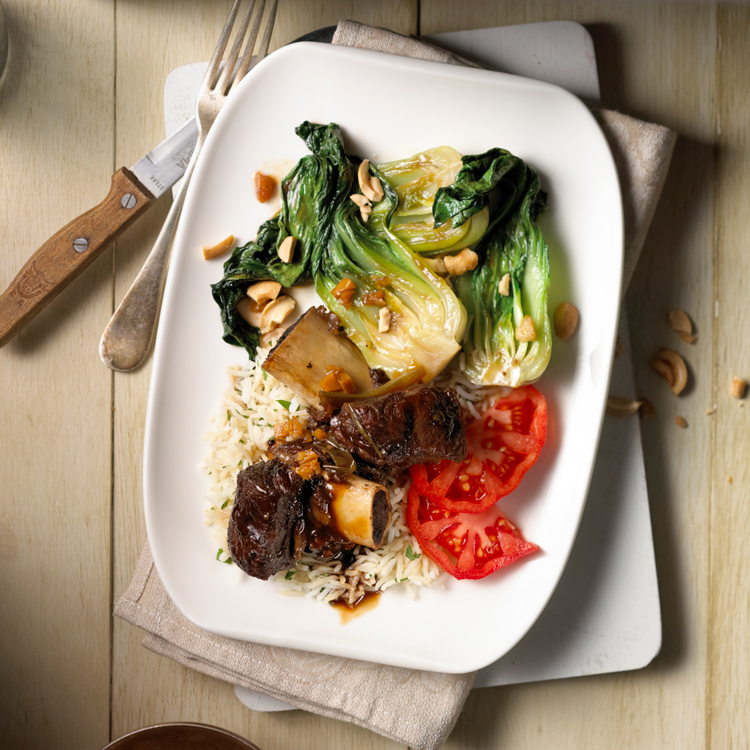 Portion beef and bok choy onto plates, along with steamed brown rice or noodles if desired. Heat remaining 1 tbsp (15 mL) sesame oil in large skillet over medium-high heat; add bok choy and sauté for 2 to 3 minutes, flipping occasionally. Add HALF of the cooking sauce and stir in HALF of the cornstarch mixture. Cover and cook until simmering and sauce thickens slightly, about 3 minutes, stirring occasionally. Garnish with sesame seeds or cashews. Skip the nuts if you are planning to send leftovers to school for lunches! *All “Kid’s Cook!” ideas herein are meant as a guide only. You know what your child can safely manage. Make sure they know and understand your rules for working in the kitchen safely and always supervise kids in the kitchen. Kids Cook! Get your kids involved in the kitchen by having them help out with this recipe. Here’s what they can do! * Have them help cut the green onion with a kid-friendly knife or kitchen shears, and help assemble the meal. Dietitian's Tip: Because this recipe is not overly saucy, do not heat it and put it in a thermos. Liquid is required to hold heat (think soupy); otherwise, it won't stay hot enough and that's a food safety hazard! My husband food poisoned my daughter once by sending fried rice in a thermos...and it's always mom they want when they are sick! Am I right?! So save yourself, and your child, the grief. Either this gets heated in a microwave at school or it goes cold which would be completely fine as well. Remove beef from bones and coarsely chop. Combine with any leftover chopped bok choy, rice and sauce. Drizzle with splash of soy sauce, sesame oil and hoisin sauce. Pack along with some sliced green onion and handful of bean sprouts. Microwave warm and combine with the green onion and bean sprouts. Will keep 3-4 days in refrigerator.